Oakland-Alameda County Coliseum is located 3 miles from Oakland International Airport and has nearly 10,000 on-site parking spaces. The complex rests on 120 acres and was constructed in 1966 at a cost of $25.5 million. The architect was Skidmore, Owings & Merrill and the general contractor was Guy F. Atkinson Company. The mere mention of the Oakland-Alameda County Coliseum stirs up a story, if not two, three or more. More than 91 million people have passed through the turnstiles. The Stadium is currently undergoing a $100 million renovation for the Oakland Raiders and Oakland A's. The architect is HNTB and the general contractor is Tutor-Saliba. The project manager is Cordell Corporation. Nearly 10,000 parking spaces are on-site at the Coliseum complex. Home to three professional sports teams, Oakland A's (MLB), Oakland Raiders (NFL) and Golden State Warriors (NBA). The natural grass in the stadium is located 21 feet below sea level. The first facility to have a professional sports team move and then return to the facility. The first complex to have an Arena and Stadium under renovation at the same time. More than 1,000 construction workers will have worked on the stadium renovation project. More than 84,000 cubic yards of concrete are being poured and 9 million pounds of reinforcing steel are being added to the stadium, the equivalent of a football field-sized block of concrete that is 50 stories high. More than 146,000 cubic yards of dirt have been hauled away. The new renovated stadium will include two 40,000 square foot clubs and a club concourse, 22,000 new seats, 125 new luxury suites, a 9,000 square foot kitchen, two new state-of-the-art color video boards and two matrix scoreboards. The baseball outfield fence will have a new configuration and look. Oakland Football Marketing Association & Oakland Raiders PSL & Club Seats -- The renovated stadium will introduce Bay Area football fans to 62,500 seats and a new level of NFL fun and excitement with Personal Seal Licenses (PSL) and Club Seating. PSL's secures the holder's right for ten years to purchase Oakland Raider season tickets, with a renewal option after ten years. You can transfer your PSL and it gives you a place in history at the stadium by having your name inscribed on the Coliseum's prestigious Wall of Fame. Club Seats provide for a relaxed feeling and offers a tremendous view of the action on the field. You receive preferred parking and high quality food and beverage. You can have waiter service right to your extra-wide and comfortable Club Seat. Exclusive large play-back screens, a concierge, club restroom facilities and a private stadium entrance and exit will be offered to club seat members. Luxury Suite members also receive the benefits of the Club Area. For more information on Oakland Raiders Personal Seal Licenses, Club Seats or Luxury Suites call 1 (800) 949-2626 or email us at skoss@netcom.com for faster service. On January 30, 1999 Scott Barvian wrote: Do you have any information on how football was played in this stadium before the 1995 renovation? I have seen photos showing the field running across the baseball field (i.e. with the goalposts near first base and third base) with a large temporary bleacher section erected in the baseball outfield - and I have seen photos showing the football field with the goal posts at home plate and in center field (and no temporary seating). As a kid in the 70's, I always thought the field was the latter configuration. But recently I've seen NFL highlight films that clearly show the temporary stands in use as late as January 1977. The temporary stands must have been an enormous pain to put up and take down during September and October while baseball was still taking place. 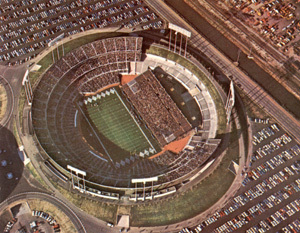 I don't know if anyone ever answered your question in regards to how football was played in the Oakland-Alameda County Coliseum pre-reconfiguration. Thus, whether you have received an answer or not, please allow me to fill you in on some history. Yes, you saw it both properly and orderly in each of the highlight film depicting Raider Football in Oakland during the first tenure. You see, Scott, when the Coliseum first opened in September 1966, all there was were the Raiders, then in the old American Football League (AFL). The Warriors were across the Bay in San Francisco and the Athletics were a season plus away from their Kansas City departure. The sight lines between what is first and third base at the Coliseum during baseball games were designed to bring the fans closer to the action, be it that the Coliseum was indeed designed solely as a multi-purpose sports facility--amongst the first originally-intended of its kind. (By that, I do not mean to include old-time baseball stadiums, such as Yankee Stadium, Forbes Field, Bears Field [later to become Denver's Mile High Stadium], Tiger Stadium, Municipal Stadium [in Kansas City], Fenway Park, War Memorial Stadium and Wrigley Field, which played host to pro football at the time as well.) Thus, since the Raiders were in Oakland first, this is how things went for the first couple of seasons in 1966-67, with the bleachers in the outfield area of the stadium for permanent football seating configuration. Then, when the Athletics came out West in 1968, of course with the two seasons overlapping as they do, they could not set the stadium up accordingly. And with the cost being quite substantial to set up from baseball to football to add those bleachers in the outfield, the logical thing was to run the football field at the Coliseum up the middle during the baseball season--running from home plate to center field--to make it more cost prohibitive. Then, when the Athletics' baseball season finally ended for good (which would at times not be until late October given this was when their first great championship run was developing) then the Coliseum would once and for all go into its permanent football configuration--the gridiron running along from first-to-third base, the bleachers in the outfield, the silver-and-black diamond end zone decorum and the yard markers featuring the numerals inside of Raideresque-shaped crests on the field. In fact, for a piece of sports trivia, when the Athletics moved to Oakland in 1968, the Raiders opened defense of their AFL title that season by playing their first three games on the road, blowing out Buffalo, Miami and Houston (whom they blew out 40-7 in the AFL title game at the Coliseum on New Years Eve '67 hours after the historic Ice Bowl in Green Bay) by a combined score of 119-45. They did not play their first regular season game at home until Week 4 of the 1968 season, by which time the Athletics' baseball season ended and the field was re-sodded and the stadium reconfigured to fit football. After an early 10-0 struggle, the Raiders then went on to score 41 unanswered points to blow out Boston, 41-10. Darryle Lamonica threw four touchdown passes and George Blanda kicked two field goals to lead the comeback charge. For the first 15 seasons the Athletics and Raiders shared the Coliseum together--the first 14 from 1968-1981 and again in the 1995 Raider return--this is how the changeover worked. But since the Coliseum was recently renovated to favor football rather than baseball, this modus operendi is no longer utilized. But to answer your question Scott as posted at the web site, this is how things worked at the time and you saw what you saw. Good question you posed and may you enjoy my answer as well. Your "editors" question at the end of the "old" Oakland Coliseum description discussing how seating was done for season ticket holders when football games were played in the baseball configuration. Season ticket holders were given 2 seat locations: your regular location & your seat in the "baseball configuration (my regular seats were in section 127--north endzone & my baseball seats were in section 118 which would be in the west endzone. The pre-season games were always in the baseball configuration--from about 1970 until 1981 (last year before moving to LA) & the first couple of regular season games actually were printed with both seat locations & they would let us know which location would be used--I also forgot to mention, this is also how they did it in 1995, the 1st year back in Oakland from LA. PS The Raiders also played several games in California Memorial Stadium (UC Berkeley) due to scheduling conflicts with the Oakland A's. They were primarily pre-season games, however they played their 1st regular season game of 1973 in Berkeley against the Miami Dolphins, winning 12-7 with 4 George Blanda field goals, the first Dolphin loss since 1971! !